The XI European Meeting on Glial Cell Function in Health and Disease invites participation from glia researchers from all over the world to Berlin. The Glial Meeting series has a long tradition. In 1994, glial researchers gathered for the first time at their “own” meeting at the University of Heidelberg. The interest was overwhelming with more than 600 participants. The Glial Meeting series was born. Meetings in Archachon (1996), Athens (1998), Barcelona (2000), Rome (2002), Berlin (2003), Amsterdam (2005), London (2007), Paris (2009) and finally Prague (2011) followed. Now, in 2013, ten years after the Berlin Meeting in 2003, the conference returns to Berlin. 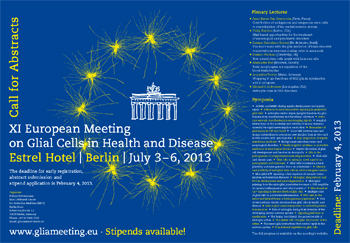 The participants will meet the large community of Berlin scientists with an interest in glial cells. 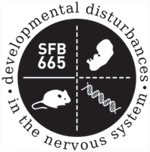 The meeting will be held in the congress hotel Estrel Berlin (www.estrel.com). The Estrel is Europe’s largest convention and hotel complex. The multi-functional Estrel Convention Center provides state-of-the-art facilities and space for every type and size of conference. Berlin is a lively, young and very international city offering all kinds of entertainment ranging from classic concerts to the most flashy performances, a large number of museums, clubs, and many sites that reflect German and European history. We are looking forward to welcoming you to Berlin in July 2013.